I suppose that your fabric shows through the stitches because you are stitching on a 28 count linen. With dark colors this can easily happen.You might want to try and stitch with three strands of dark threads in order to cover better the fabric. 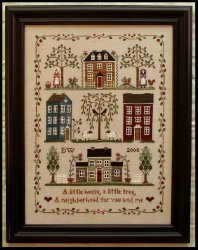 I am not having this kind of problem, but I am stitching my Neighborhood on a 36 count linen (with two strands of thread over two). Good luck, your work is beautiful in any case! Your work is beautiful! I have noticed the same thing a little bit with the fabric showing through - I am using 32 count linen. What I've noticed though is that it's not as noticeable when I hold it up as if too be hung. I think some of that is the angle. Keep going...it looks great! You are going well with your piece, I am in the middle of the red house, I must take another photo soon. Keep stitiching. Nicky, your progress looks great! The others made some nice suggestions here too.